Coasteering is a fantastic adventure water sport that provides the perfect opportunity to get wet and see the coast from a different perspective. The activity involves sea swimming, jumping from the rocks and into the sea and some exciting scrambling as you traverse along the coastal edge within the intertidal zone and explore the many features in and above the water. 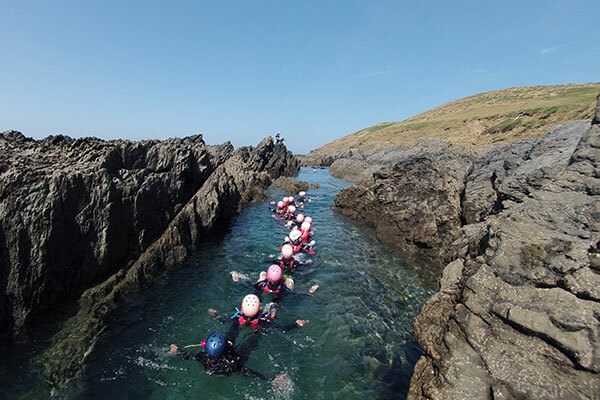 A top feature of Coasteering with H2Outdoor is the excitement generated when our instructors get you fully in the “impact zone” where water, waves, rocks and gullies come together to provide a very high energy environment. Led by qualified and experienced instructors, Coasteering is the perfect way to explore the coastline and there are few activities that will get you closer to it! 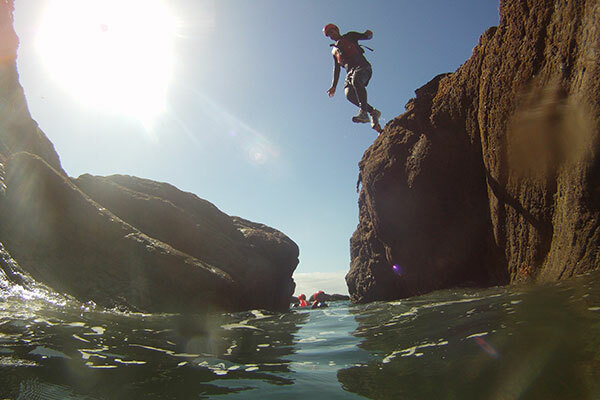 A Coasteering session with H2Outdoor will take you on one of our carefully chosen routes where you will swim, scramble and climb along the rocks and then leap into the sea before moving on further around the coastal edge to the next challenge. All of our sessions are tailored to each group and will take you to hidden rock pools, sea caves, beaches often inaccessible to other people and the all important jumps that tend to be the highlight of the trip. All safety equipment is supplied. We usually run our coasteering sessions along the amazing Baggy Point which heads the northern edge of Croyde Bay. This location dominates the local coastline and offers not only a spectacular setting but one of the best places in the country for this activity due to the varied terrain, sea caves and rock formations. Come and experience a selection of different jumps, The “U-Bend”, “Swirly Gully”, “The Waterfall” and loads of other exciting features that will make this trip one to remember. We have routes at this location that are perfect for those new to the activity or for groups with mixed abilities and can tailor the session to a range of requirements. 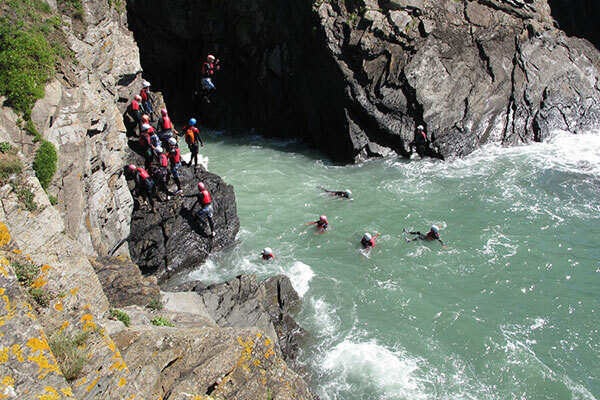 Hele Bay (near Ilfracombe) is another excellent location for coasteering in North Devon but is more for the adrenalin junkie with some fantastic high jumps, long swims and some fun coastal features such as “the Washing Machine” and “Tide Race Gully”. Sections of this route are at the base of some of the highest cliffs in the area which gives the real sense of exposure and adventure and offers some stunning scenery. 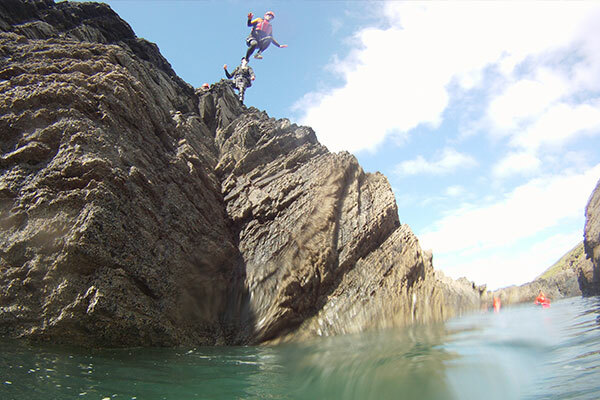 We also run coasteering in Ilfracombe, Mermaid Cove and Lee Bay so please enquire about the various options. Prices start from £40.00 per person per session. If you love being in the ocean and want to make more of your coasteering experiences whilst here in North Devon, then why not try out our "Big 3". Our instructors will guide you along 3 of the best coasteering locations in the area over 3 days and you will find that each one has its own highlights, stunning scenery and challenges. Prices start from £80 per person for the Big 3 package. Please contact us for more information. H2Outdoor has teamed up with the National Trust to provide a coasteering experience for those that would prefer the emphasis of their session to be on exploration. 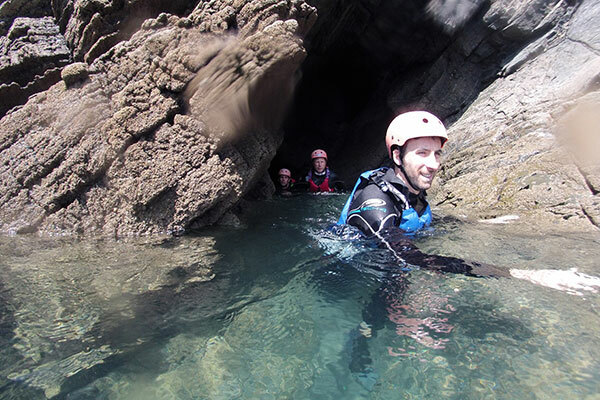 During the coasteering Rock Pool Ramble, you will be wearing all the same safety equipment as a standard Coasteering session and will be guided along the coast to explore the caves, coastal features and all the amazing creatures the tide has left behind. Your knowledgeable instructor will be on hand to show and explain about all the things you will discover. Where did Coasteering come from? Although aspects of coasteering have been done by people (especially surfers) for a very long time, the term appears to have been used first in 1973. In the book Sea Cliff Climbing, John Cleare and Robin Collomb said "A few enthusiasts believe that coasteering will become popular and has a big future". In the 1990s, it emerged as a commercially guided recreational activity initially along the cliff coastline of Pembrokeshire in Wales. By 1997 write-ups started appearing in the travel/recreational pages of the newspapers showing that several commercial companies were offering such an activity. The activity then spread to all regions of the UUK where there are suitable rocky coasts, including Cornwall, Anglesey, Devon and the Highlands and Isles of Scotland. Is there a Governing Body for Coasteering? Although Coasteering in the UK is recognised by the Adventure Activities Licensing Authority which is a department of the Health and Safety Executive, there is no governing body for this activity. The National Coasteering Charter is an advisory body for providers and is supported by organisations such as the RNLI, ROSPA, MCA, AALA. H2Outdoor is a member of the National Coasteering Charter and is licenced under the Adventure Activities Licensing Authority. It is very important to book in advance to avoid disappointment on the day. We are governed by the times of the high tide and as such may only be able to run one session per day. We like to get around 2 hours in the water but you will need to allow longer for getting changed and walking to the start of the route. Longer sessions are available on request. Do you have to be a strong swimmer? All group members will be wearing a range of safety equipment which will include a personal floatation device. Being able to swim 50m is advisable but more importantly you will need to be water confident. We ask that all participants are 8 years and up. If you are at the other end of the age spectrum, you may be required to provide confirmation from your doctor that they are happy for you to participate in such activities. All safety equipment and wetsuits are provided within the price of the session however you will need to bring something to wear under the wetsuit (swimwear is ideal) and a pair of trainers that you are happy to get wet. When it is raining, we find there is nothing better to do than to throw ourselves into the water and get wet from every direction. The only time we need to cancel is if the conditions are dangerous or unsuitable for the group. We have other locations available that may offer more shelter or a different activity suggested if required.